Before green flowers became a hot trend, there were bells of Ireland, a flower in cultivation since the 1500s. Also known as shell flowers, these flowers are native to Turkey, not Ireland, but their fresh green color and symbolism of luck derived from the bell shape give them their Irish nickname. Bells of Ireland grow in all zones but fare poorly in areas with hot and humid summers. Shade cloth can go a long way towards prolonging the vigor of the plants when summer's heat kicks in. The plants need at least partial or morning sun to prevent flopping, and you should expect healthy plants to grow about three feet tall by September. 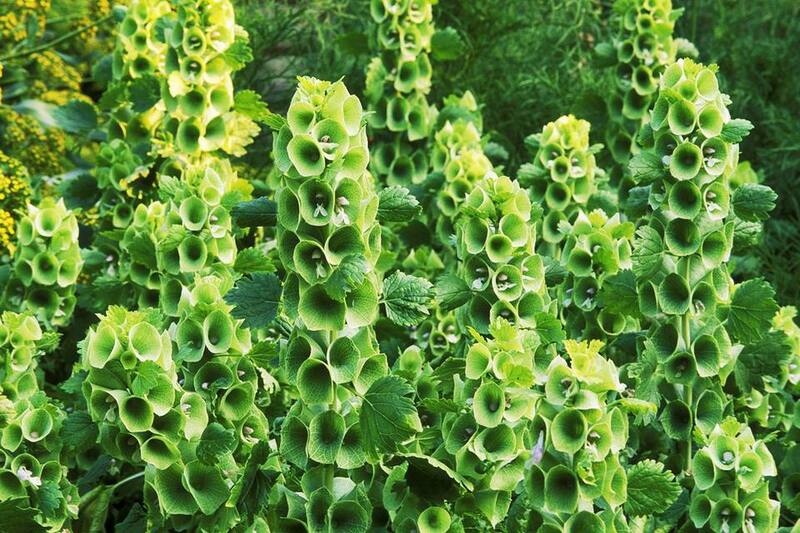 Stratification increases the germination rate of bells of Ireland. You can expose them to cold by sowing them outdoors in the fall, or by refrigerating them for a week before starting them indoors. Don't just place the seed packet in the refrigerator; for best results, combine moist conditions with cold temperatures to mimic the transition of cold, moist soil the seeds would experience outdoors. Sandwich seeds between moist coffee filters or paper towels in the refrigerator, followed by planting in soil. Experts say this moist stratification results in a higher germination rate than simply exposing dry seeds to cold temperatures. If you are lucky enough to find a well-stocked nursery with plugs or young plants, it's worth the extra money to start with these the first season. Doing this allows you to see if bells of Ireland grow well in your area without a significant investment of time or effort. If they take off, you can plant a bigger patch from the seed you save the following season. Keep bells of Ireland consistently moist during the vulnerable seedling and transplant stages. Soaker hoses are great for providing moisture without water-logging the plants. Bells of Ireland are top heavy, and they may topple over after a heavy rain or in areas exposed to wind. Stake the blooming stalks, grow the compact variety, or grow them in a sheltered area to keep the spires upright. Bells of Ireland don’t re-bloom, so you can remove plants past their prime without guilt. However, you may want to leave them in place long enough for the seeds to mature and scatter, as these annuals are self-sowing. Bells of Ireland flowers are easy to dry, and they add interest to fresh cut flower arrangements. The lime green flowers make an attractive foil for wine or magenta colored flowers, like ‘Red Velvet’ celosia, globe amaranth, or ‘Purple Prince’ zinnias. In small or container gardens, look for the compact 'Pixie Bells' variety, which attains a height of two feet. The best time to gather bells of Ireland blooms is when If you harvest bells of Ireland for fresh or dried bouquets, wear gloves to protect your hands from the small spiny thorns that grow along the stems! This feature that keeps rabbits and deer away can also pierce your skin. The stiff calyces of bells of Ireland last up to two weeks in fresh arrangements, but the flowers don’t maintain their green tint as dried specimens. The bells will gradually turn tan when they dry. For a fun bouquet twist, spray paint dried stems gold or silver and pair with fresh green stems.